Complete sterile set designed for dressing the operator and the staff in the operating room. Ideal for all dental implant surgery, periodontal surgery and maxillofacial operations. The set also includes patient drapes and surface drapes and 1 handpiece sheath. The pack contains 8 sets. Advantages: Allows you to have available everything you need for the operation. Drastically reduces management times and the warehouse space occupied by “loose” materials. Avoids possible oversights during preparation. Avoids hazardous cotton drape washing and regeneration procedures. Excellent quality/price ratio. 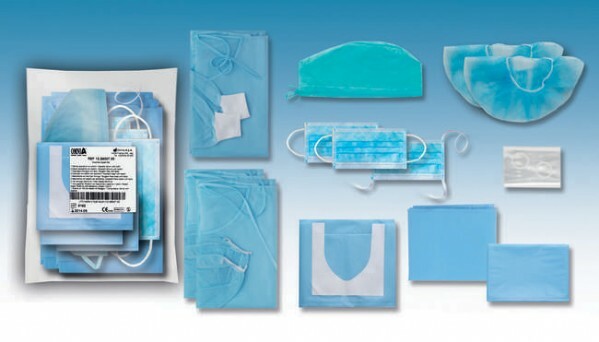 Each set consists of: 1 Operator gown (water-repellent) with cuffs, in light blue SPPB 2 Assistant gowns (water-repellent) with elastics, in light blue SPPB 1 Surgical cap with ties, in absorbent NWF 2 Round caps with elastics, in absorbent NWF 1 Mask with ties for surgeon, in light blue NWF 2 Masks with elastics for assistant, in light blue NWF 2 Water-repellent surgical drapes 50x75 cm, in light blue SPPB 1 Water-repellent patient drape 75x90 cm with adhesive U-shaped split 11x9 cm, in light blue SPPB 1 Sheath 12x07 cm with fixing elastics, in transparent PVC.